A three goal blitz in the first 7:07 of the game helped propel Schoolcraft past Lake Michigan College 6-0 on Saturday, Sept. 28. Schoolcraft opened up the scoring just 6:26 into the game, when sophomore defender Chelsea Meador slid the ball through the Lake Michigan defense to Kelly McKay who beat Red Hawk goalie Jayme Cox. McKay had four-of-the-six Schoolcraft goals on the day and was pleased with her team’s overall effort. “Everyone worked really hard today. As a whole, it was a solid unit effort,” McKay said. 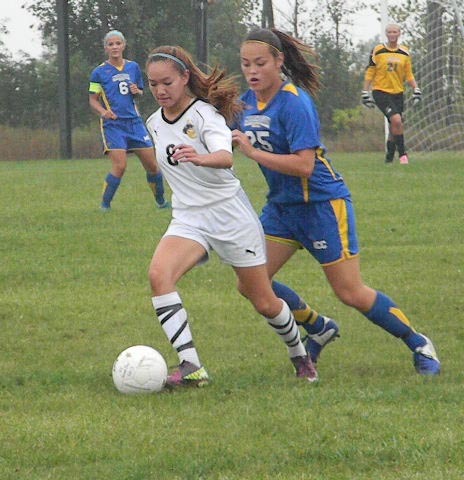 Meador scored 17 seconds later, when she beat Cox to put Schoolcraft up by two goals. by three just 7:07 into the first half. Freshman forward Remy Huttekier notched the fourth goal of the game when she launched a powerful kick from 35 yards away into the upper right corner of the net at the 58:04 mark. McKay netted the final two goals less than ten minutes apart from one another, giving her nine goals on the season. At 70:07, she headed-in a Jessica Parry corner kick from the middle of the box, and at 79:58 she tipped a loose ball past Cox making it 6-0. Coach Shrivaman was impressed with McKay’s composure as well as her ability to execute scoring opportunities in the victory. Shivraman was pleased with the way his team kept the shutout in the win. McKay said she was proud of the way the team played in the shutout. The Ocelots are currently 8-0-0 overall, 8-0-0 in Region XII play and 6-0-0 in MCCAA contests. As of September 25, the women’s team moved back up three spots in the NJCAA Division 1 women’s soccer rankings to number 14 in the nation. For the last two seasons the Women’s Soccer team has been MCCAA champions and by the way this team is playing, they are well on their way to be crowned three time champions. For all the latest standings and game summaries go to www.mccaa.org.